The acrid smell of two-stroke exhaust mixing with the sweet smell of the cedar transported me back to a bygone era – a time of wooden decoys and boats and huge duck numbers. The boat was a cedar sneak boat over 50 years old. In the water 200 yards distant, the decoys were mostly hand-carved wooden blocks. Although not as old as the boat, the decoys were still carved with the same care of the decoys of old. The distance from the decoys signaled this wasn’t a typical duck hunt. It was a sneak boat hunt on Lake Erie’s Long Point Bay. Situated on the Ontario side of Lake Erie, the bay is one of the main staging areas for waterfowl in the eastern flyway. A culture of waterfowling evolved that started with the formation of the famous Long Point Company in 1866 with wealthy hunters from Canada, the United States and England as members. 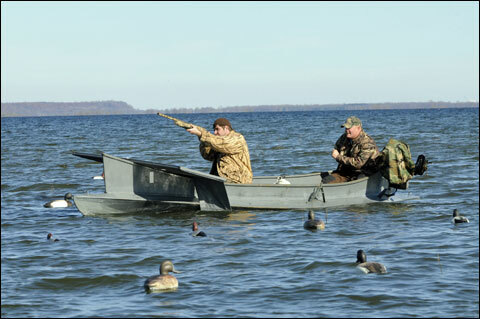 Brent Rohrer, front, and Mike Cosyns take a turn on some ducks in the sneak boat. Besides the heritage, Long Point Bay was an appropriate place for a sneak boat hunt with the huge number of diving ducks stopping there. Several guides call the bay their home waters, including Glen Rohrer of Coletta Bay Guides. He is the sole guide actively promoting sneak shoots on the bay. 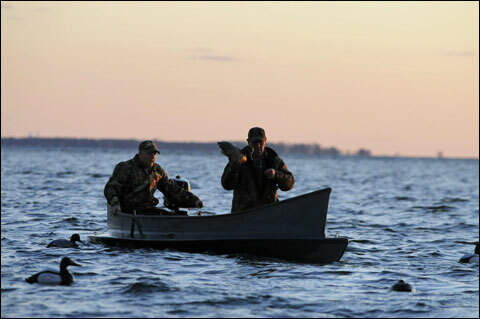 With sneak boat shooting, a large number of diver duck decoys are set, then the boat is anchored 100 to 200 yards upwind. 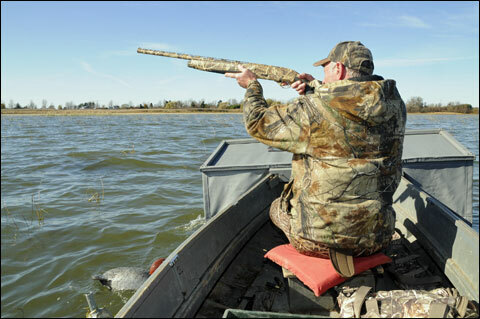 Any movement and the view of the hunter are blocked from any ducks that land in the decoys by a screen on the bow of the sneak boat – hence screening, another term for this method of hunting. Typically it’s a two-person operation, with the person in the back paddling or using the paddle as a keel as the wind propels the boat. After reaching the decoys and drifting in shotgun range of the ducks, the hunter drops the screen and shoots. The screen on the bow of the sneak boat has slots to watch ducks. While this is duck hunting in its purest form with decoys, there is no calling. Waiting for ducks is a part of the game, but sneak shooting combines the excitement of jump hunting ducks with blind hunts. A sneak boat needs to be small enough to paddle, but seaworthy enough to take fall’s wind and waves. Rohrer’s boat traces its roots to Lake St. Clair in the 1940s. It’s a wooden lapstrake craft, 17½ feet in length and painted grey. Rohrer purchased it from retired guide Don Millar, who had the boat fiberglassed and foam blown in for stability. My hunt started when I met Rohrer in the November pre-dawn blackness on a day with a forecast that wouldn’t be considered prime duck hunting weather – sun and southeast winds under 10 km/h. The best winds for hunting that part of Long Point Bay were northwest or southwest past experience taught me. After the author shot his limit, Glen Rohrer took his turn shooting ducks. You can see the dropped screen and hand-carved decoy. Our hunt was for bluebills and other divers. As we launched in Port Rowan next to the steel-clad boathouses that lined the harbor for decades, the twinges of orange and red that signal dawn started to appear. I could see huge flocks of ducks out on the bay, flying just above the surface. The brighter it became, the further I could see and the more ducks I could see. Rohrer likes to set up in the daylight for safety reasons. Not long after it could be considered daylight, we headed out, the small two-stroke pushing the heavy boat slowly, but steadily, forward. 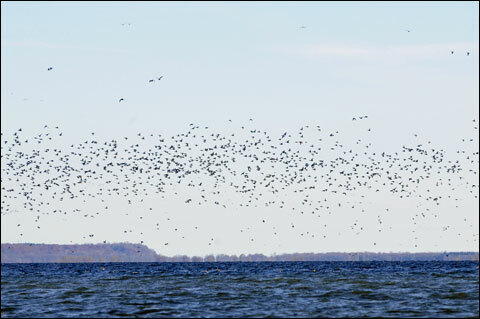 Flocks with thousands of birds are one of the usual highlights while hunting Long Point Bay. While setting up, we got a preview of how many ducks were in the bay when it reached the magical point of the morning when all the ducks decided to stretch their wings at once. The sky was literally blackened. Rohrer explained the blocks are set out in four lines of 10 to 12 birds each. Longer lines go on the outside and shorter on the inside. On the upwind side, 18 singles were placed that serve as stoppers. 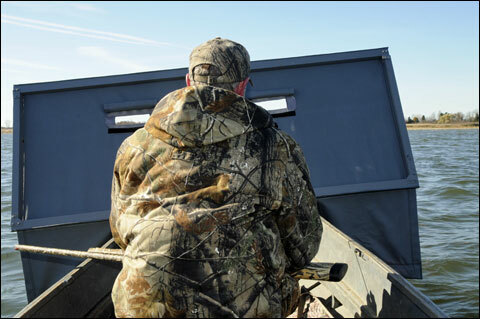 These decoys bring birds in and help retain the birds as the shooter in the boat approaches. 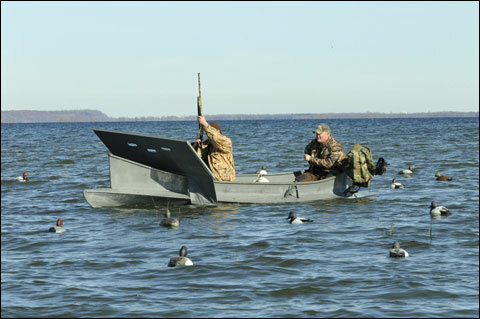 Setting the decoys out in lines allows the boat to maneuver amongst the set with less chance of becoming tangled. Decoys were set facing into the wind. Bluebill decoys were in the front, redheads in the middle, and canvasbacks at the back. The placing of the decoys takes into account the characteristics of their real counterparts. 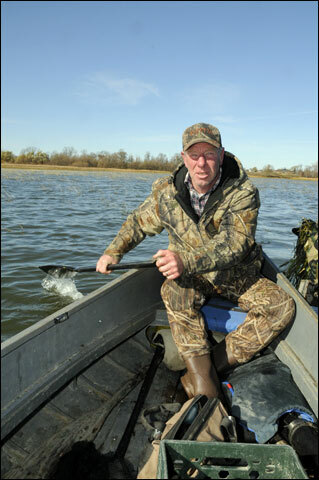 Rohrer’s experience reveals bluebills don’t hold as well as canvasbacks when sneak shooting. Laying out the hand-carved decoys from the sneak boat. High quality decoys have historically been important to sneak shooting and are still crucial equipment today. “The ducks had to be comfortable enough in the decoys they would stay there while you screen,” said waterfowling historian and author Paul Brisco. He explained most decoys are made to attract birds for hunters to shoot while flying over the decoys, or just after landing, he added. A screening decoy, on the other hand, must let the birds feel safe enough for the five or more minutes it could take the hunter to get within shooting range. Plastic decoys, which don’t ride the waves as well, aren’t as effective. Brisco’s research looked into the interesting story behind sneak boats and the technique itself. In Ontario, it was popular on Lake St. Clair and in Lake Ontario’s Hamilton Bay. “Screen shooting,” as the technique was known in Hamilton Bay, became popular along the beach in the late 1800s. Hunters lined the beach when the wind was blowing offshore. They used the wind at their back, along with a little sculling and pushing off the bottom with the paddle to propel themselves towards their decoys. Screens in the front of the boats were usually made of reeds. The popularity of the technique and spot lasted 50 to 60 years until the 1940s when laws were passed restricting shooting in the bay. the wind pushes it towards a flock of ducks that lighted in the decoys. 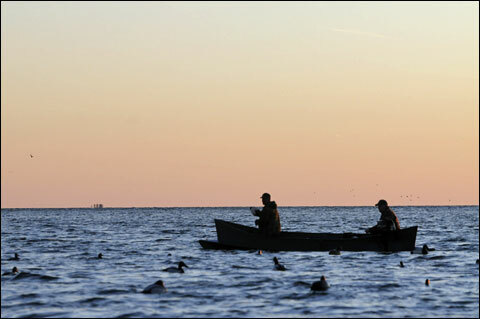 On Lake St. Clair, duck hunters called a similar technique drift or sneak shooting. It’s similar to what Rohrer still uses on Long Point Bay with the boat anchored upwind until the ducks set in the decoys. Boats built for shooting in Hamilton and Lake St. Clair looked similar, Brisco says, except the latter are generally larger. Both were wooden boats with closed bows. Sneaking was once popular enough it spawned boat makers such as Weir Boat Works and Morris Boat Works of Hamilton and Frank DeRoevan of Wallaceburg. Many of the boat manufacturers were also decoy carvers. I quickly saw time hadn’t diminished the effectiveness of the technique. We weren’t anchored long before birds started working the decoys. But, when flock after flock buzzed the set and wouldn’t set, a decision was to pick up and move the decoys closer to Big Creek. Unlike traditional duck hunting, we waited for sunrise before setting out the decoys. That proved to be the right decision. We weren’t even anchored upwind before birds had set in the decoys. We made the sneak, but I dropped the screen too soon . . . . and missed. “Wait until you get closer, or if it looks like they will break,” Rohrer advised. The next opportunity was a single bluebill. I waited until we were closer, dropped the screen and hit the bird on the first shot, just on the edge of the decoys. Glen scooped the bird out of the water, returned to our anchor and a pair of buffleheads settled in the decoys. Glen released the anchor and we are off. These birds were on the far side of the set. As we drifted through the decoys, I prepared to drop the blind and mount the gun in a hurry. I took one of the two. With the screen dropped, it was time to shoot some ducks. The trend continued over the next couple of hours. Most times, we probably sat a maximum of five minutes before more birds landed. That didn’t mean there were that many shooting opportunities. Often we reached the decoys and the birds had swam out or took off at our approach. Other times, more birds landed in the set while we were approaching. A highlight of the morning was seeing the unmistakable outline of a canvasback just after discovering the birds had left the set. “Get the blind up,” Glen ordered. We lined up and drifted closer. We approached to within 30 yards before I dropped the blind. The bird appeared stunned for a second before I threw up the gun and shot. The first shot was just behind, but I connected on the second and the hen canvasback tumbled to the water. It was exciting shooting, and just seeing the hundreds of ducks in the area was a sight to behold. It was one of those days when if I looked 360˚ around while we were anchored, there was always a duck in the air. At one point, as the sun climbed higher, I didn’t see one in the air, but only needed to turn around again to continue the streak. It took us until noon, or three hours, to harvest my limit of six ducks - with a mixed bag of buffleheads and bluebills, plus one canvasback. Some of the birds were long shots. Others held until we got within 20 yards. As we were picking up the decoys, I took a look behind us, seeing flocks of ducks of mixed species trade on and off the water, stretching their wings. Their numbers were well into hundreds, likely the thousands. Looking to the bow, I saw the limit of ducks lying on the wooden decoys. If my mind blocked out the Port Rowan water tower, it really was easy to imagine this was a hunt on memory lane. Jeff Helsdon is a multi-species hunter and angler from Ontario. He was the second person to complete a Canadian slam of turkey hunting, bagging eastern birds and a Merriam’s in Western Canada. When he's not turkey hunting, Jeff enjoys fishing with his family, especially on Lake Erie and hunting for upland game, waterfowl and deer. His articles have been published on both sides of the border and have won awards from outdoor writer's groups. He is also a field editor for the Ruffed Grouse Society.